Few things are as good as really well-made, fresh bread. That initial crunch, then the springy softness of the inside, perhaps still warm. Even better when it’s homemade and the smell of bread baking fills your kitchen and lingers throughout the house. I’m lucky to have a passionate home baker as a husband. 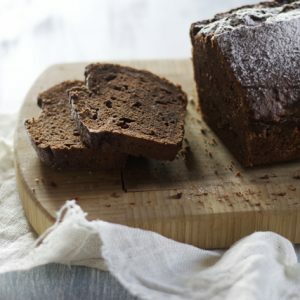 I love having homemade bread around but if it weren’t for him, I probably wouldn’t be able to get all the way through the process – these days, running around after a curious, walking one year old, it’s hard to even finish a cup of tea. So while I’m passed out after an exhausting day of following the baby around, husband, on the other hand is up late at night, mixing up a bowl of dough and putting it to rest so the next morning fresh bread is ready to be baked. Focaccia is a favourite. 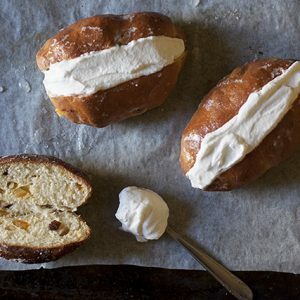 An easy, forgiving bread, so charming in its rustic nature and so moreish. Sometimes it might be plain, sometimes topped with ripe tomato, sometimes it’s baked with a filling inside (sausage and broccoli, yes please), a little like a cross between bread and pizza. And when it comes to something like this, there’s no one better to take advice from than baker and pizzaiolo Gabriele Bonci, the larger than life figure behind Rome’s pizzeria, Pizzarium. This is based on Bonci’s recipe for Focaccia Pugliese, a beloved bread from Italy’s southern heel – thick, spongy and hearty. It’s amazing to think that this dough is 80% water. It’s delicious eaten while still warm – one of the benefits of making it at home – and it’s best eaten the day it’s made. In a large bowl, combine the flour, yeast, water and salt. 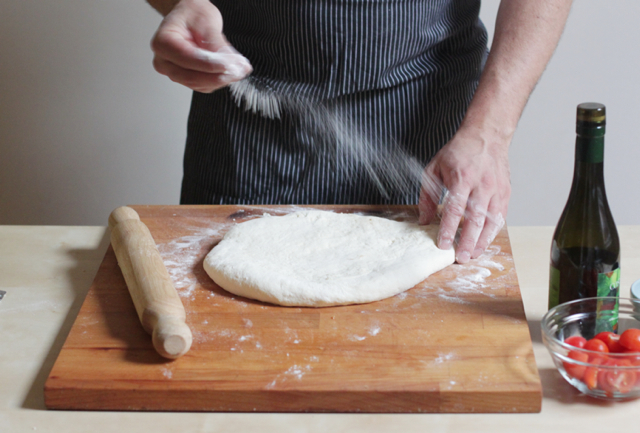 Knead the dough for a few minutes until it comes together. 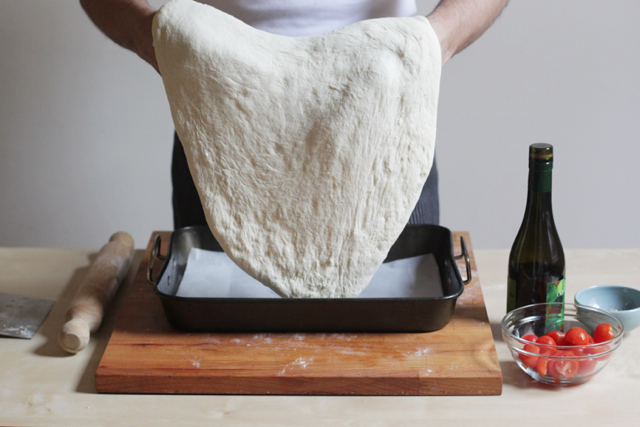 Place the dough in a bowl oiled with olive oil and leave in the fridge for 24 hours to rise. Roll out the dough on a floured surface, folding the dough in half, turning 90 degrees, folding in half again, turning 90 degrees and folding in half a third time. This adds strength and elasticity to the dough. Roll it out to a thickness of about 2cm and place the dough in a large rectangular baking tray dusted with breadcrumbs, spreading to the edges. 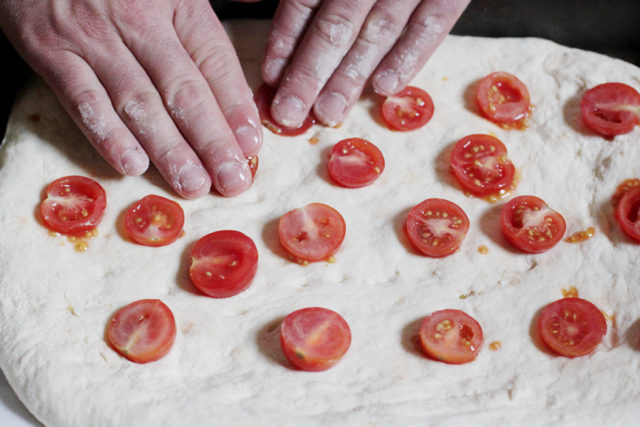 Arrange the cherry tomato halves on the top of the dough. Drizzle olive oil and sprinkle salt and oregano on top. Let rise for another hour. Place on the bottom rack of a hot oven (220ºC) for 15 minutes (this helps the bottom get nice and crisp) then move to the middle rack and continue baking a further 10 minutes. It should be golden and crisp. Cut into squares and enjoy your focaccia warm or that day. It is beautiful and really appetizing! This looks so wonderful, and how fortunate you are to have a husband who makes breads! I don’t mean to quibble, but reading that this is 80% water took me aback. In fact, the flour to water ratio is less than 1:1, as there is a kilo of flour, and 800ml of water, which weighs 800g. Unless, of course, I am mistaken in my calculation, in which case I apologise. Regardless, it looks wonderful and I always look forward to reading what you have been cooking, baking, and photographing. Hi Cecilia, yes you read right! You need 1 kg of flour to 800 ml/800 gr water. This type of flour absorbs plenty of water. You have a wet/sticky dough to begin with but after the kneading/folding technique it gains strength and elasticity like in the photos. 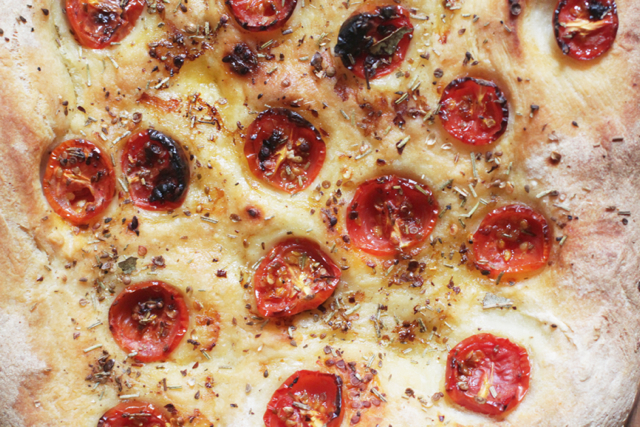 You need a soft dough for this focaccia to be so airy and fluffy. Hope that answers your query! Cecilia, bread bakers relate the hydration of a dough by the weight of water used in relation to the weight of flour used. This formula is indeed 80% water, that’s 80 bakers percent. Naturally in the course of being baked some of this moisture will be lost, how much depends on many factors. This method of relating the other ingredients to the weight of the flour allows bakers to instantly assess a formula. To those unfamiliar with bakers percent, it seems rather mysterious magic maths! Emiko, lovely to see your wee girl stretching out for a piece! I’m sure you’ll have an exciting Christmas. Thanks for relaying this so eloquently, Robyn! Happy holidays to you too. Robyn, thank you for that explanation. Since it is particular to bakers, and not being one, it left me puzzled and didn’t seem logical – for me, that is. Each discipline develops its own vocabularly, understood by those who practice it, but often seeming arcane to others. There’s nothing like fresh foccacia, I make a potato foccacia which is bascially a ratio of half mashed potato to flour which also makes it deliciously spongy and fluffy. Oh yes, potato focaccia, delicious! Lucky you in having a husband who bakes bread for you – I totally agree there is nothing better than having freshly baked bread at home (aside from the amazing taste it must be the anticipation after the long and slough prove and watching the sheer magic that turns water, flour and yeast into this beautiful piece of bread). In our house, I am the one who bakes the bread, the pizzas and the foccacias, not that I mind though as my boyfriend is only too greatful to gobble it all up and help clean up the kitchen! I am a big fan of Bonci’s technique too which put me on the road to the best homemade pizzas I have yet been able to make! I bet the homemade pizzas are perfection with Bonci’s technique. 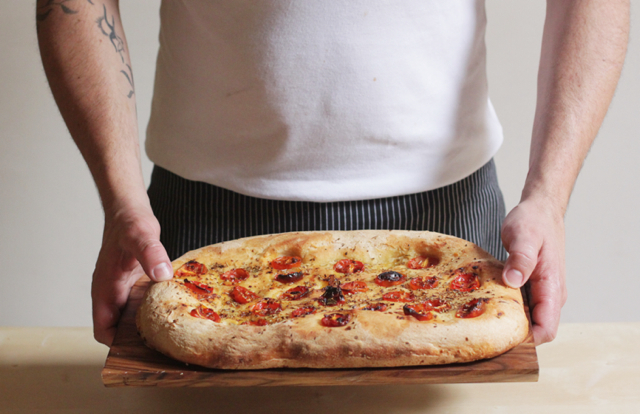 Might just have to procure his Pizza book! I still have not gone to eat at Pizzarium, but the next time I’m in Rome, it has to happen. In the meantime, I shall try this recipe of his. I have a feeling it will be gone in a flash. oh the little hand! I love Bonci’s pizza and foccaccia, you know, I love the soft chewy breadcrumb, and the toppings as well. 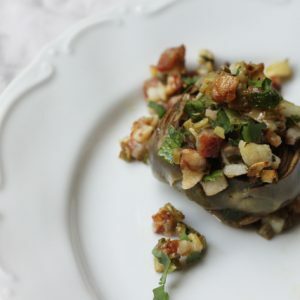 Claudia once tried to make it with artichokes, it was delicious! What’s the difference between focaccia Pugliese and Genovese? Focaccia Genovese is what many think of the “classic” focaccia — it’s soft and fluffy (thanks to the presence of Ligurian olive oil in the dough itself) and quite “tall” for a focaccia. It’s eaten at every moment of the day (many Genovesi even dunk it into caffelatte for breakfast!). 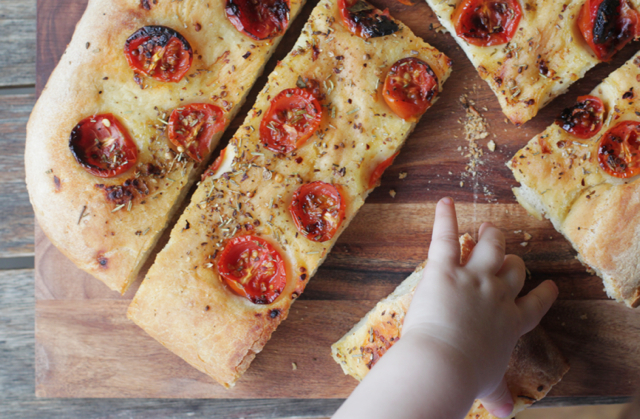 Meanwhile, focaccia pugliese is made with pure semolina (durum wheat) or a mixture of semolina and regular wheat flour, it’s more rustic — and it is not plain, but studded with cherry tomatoes and oregano (not something you would want to dunk in your morning coffee!). Puglia has many variants on “focaccia” and there is also a type where mashed potatoes are incorporated into the dough. To be more precise, the one you see here is the classic focaccia from the area of Bari. Maybe this is too simplified but you could think of focaccia genovese as more similar to a kind of bread where focaccia pugliese is more like a pizza. Hope this helps! Right. Baker’s formula. Rule one: flour is 100%, and everything else is a ratio to the weight of the flour. Thus an “80% Hydration” recipe has a quantity of water that ends up weighing 80% of what the flour weighs. This unique math only applies to baking, so forget trying to make it fit any other mathematical logic scheme. 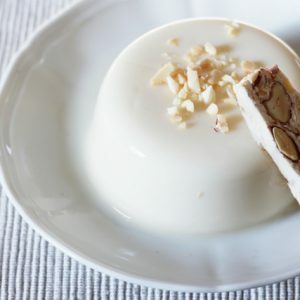 Let’s say for this recipe that the baker’s formula for yeast is (as it often is,) two percent. If we’re using a KG of flour, we’d translate that formula to 20 grams of yeast, equal to two percent of the weight of the flour. Why do this? Because you can use the percentages to adjust a recipe to any number of servings. Double it, halve it, and it will still come out consistent because you’ve kept the ratio between ingredients. Basically this is all a system of ratios, where the flour is the starting point and represents 100 percent. If you mix whole wheat or other flours into white, they are added together to get to 100 percent.